 The prolific Mellen (Creative Writing/Film, Temple Univ.) brings a literary talent as well as cinematic eye to the family saga of Kay Boyle (1902-92), an epic life reflecting the great literary and political events of the century. 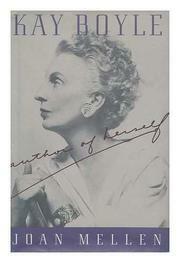 Behind the 30 volumes of fiction and poetry, besides essays, reviews, letters, and the short stories that Boyle brought to perfection in the New Yorker, was a restless, passionate, ambitious, desirable woman, as intense and prolific in her writings as in her loves and political beliefs--beliefs ranging from the anti-Semitism she shared with Ezra Pound in the 30's to the radicalism she shared with Joan Baez and Eldridge Cleaver in the 60's. Drawing on massive primary sources, family interviews, and the thousands of unpublished letters Boyle sold during her lifetime to earn money, Mellen tactfully presents her subject's public life as a successful author (``our little Dostoyevsky in ski pants,'' according to Kazin); her political life as an activist during McCarthyism and then Vietnam; and her private failure as a mother and wife. Incapable of introspection, Boyle retained her glamorous facade into old age, oblivious of her flaws, of the pain she caused those who loved her, or the significance of the causes she opposed (capital punishment, the Vietnam War, feminism) or the ones she sacrificed herself for: student rights, the Black Panthers, nuclear disarmament, migrant workers, Amnesty International. Jolas, Duchamps, Beckett, Djuna Barnes, Joyce, Lawrence are all here. And the scenes are incomparable: Paris in the 20's, Europe on the eve of WW II, America in the 50's, Haight-Ashbury in the 60's, and the campuses of the 70's, where this self-taught writer ended up teaching. Precise in detail, panoramic in scope, psychologically subtle, more than a literary biography, like Boyle herself, it is social and political history, a film waiting to be produced.